Last week's recipe was hopjesvla, and I received great feedback on the blog, on Facebook and through email. Thank you all for your positive reactions, it looks like there are many vla-lovers out and about! 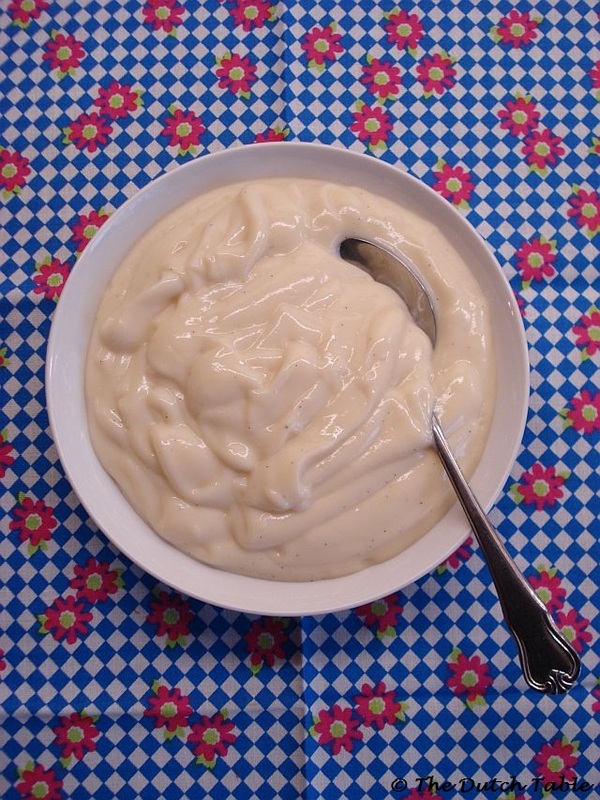 Vla triggers childhood memories, as it is a comforting dessert, and one that is solidly engrained in Dutch culture. If you have been near, into, or grew up with Dutch cuisine, you have probably heard of, or even tasted, vla. It is the ultimate Dutch dessert. But not everybody likes coffee, the predominant flavor in hopjesvla, so when I said I also tried a recipe for vanillavla, the requests came flying in. This is so easy to make, and tastes great. You probably have all the ingredients at home already so let's get started! 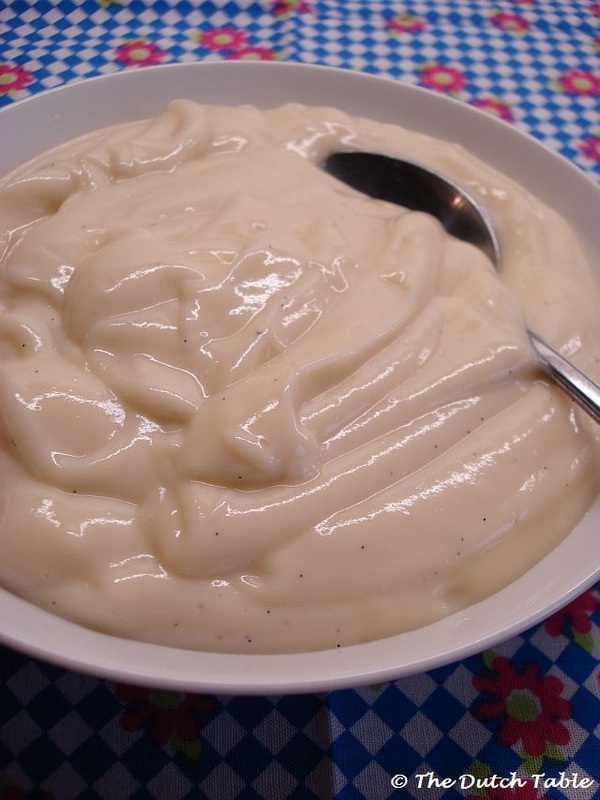 If you leave out the vanilla pod, you have the basic recipe for a simple vla: a great excuse to experiment with your favorite flavors. 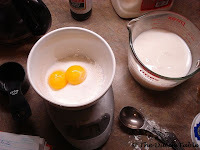 Bring the milk to a simmer in a heavy saucepan. Slice the vanilla pod in half, lengthwise. Scrape the seeds from the pod and add both seeds and pod to the simmering milk. Leave it on a slow simmer on the stove for about ten minutes. Remove the pod. Take the saucepan off the stove. If you must have a supermarket yellow vla, stir in the drop of food coloring. If not, pour the vla a bowl and cover the top of the custard with food film: you don't want a thick skin to form as it cools. Let it cool, preferably overnight. 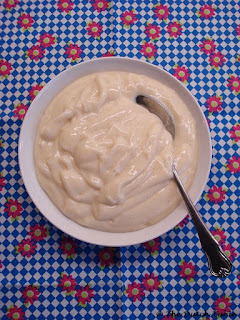 Stir the vla with a spoon before serving. If it's too thick, add a tablespoon of milk at a time until you reach the right consistency. Enjoy it by itself, mixed with tangy yogurt or with fresh fruit. Lekker! Thanks so much for posting this recipe!!! Going to make it tomorrow. Ben zeer benieuwd naar de reactie van mijn zoon, de vlafreak! Vergeet niet de vanillestok uit de melk te vissen voordat je de vla gaat binden. Een snufje zout is goed voor de smaak. I'm really interested in the caramel flavoured vla that you talked about in your previous post. How would I get the caramel flavour using this recipe? Or would I need a different recipe? Thanks! What is meant with food film? Saran wrap or plastic wrap. Oh, I can do that. thank you! Gonna try it today! Got all the ingredients, but I was shocked that vanilla beans are $6.99 each! that's going to be expensive vla. Can the bean be substituted by the extract and by how much? Wow, that is expensive, I seem to recall paying little over a dollar a piece, they usually come five or six to a jar. You can use vanilla sugar or vanilla extract. It is difficult to say how much to use, as extracts can have various strengths. Start with one tablespoon, then taste and adjust accordingly. Made it last night used an extra tbsp of vanilla extract because I did not have vanilla beans. The flavor is good but it was bit lumpy, maybe I heated it to much??? I will definitely try it again. I think we're gong to have fun with this blog. Mine sometimes comes out lumpy too, it's most often the overheating that does it. It doesn't affect the taste, but is sometimes awkward for "new" vla eaters. If I have company over for dinner, I strain the vla through a mesh sieve (zeefje) to take the lumps out. Just pour the vla in the sieve and carefully stir a wooden spoon until all the vla has passed through, then carefully reheat if needed. No lumps!! Nicole, this advice saved the day! I made some vla for our guests tonight, and put it through a kitchen strainer for smoothness. Came out great, thanks again. Ik lees net wat heerlijke recepten op deze blog, wat leuk, nu kan ik mijn engelse vriend de lekkere nederlandse gerechten maken die ik zo mis ! Bedankt ! I skipped the vanilla bean and added only one tbs vanilla extract. Perfect! Most of us at some point have felt the need to earn extra money. someone makes a purchase which in return makes you money. Ik ben net terug van NL en mij tante zeid dat ik kon maken met custard. Dus heb dat gekoch, hoe dan? 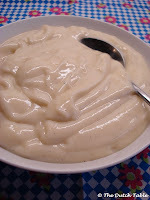 Is het net als deze recept allen custard = cornstarch?